Cute little lamps! Perfect touch for my master bedroom, like that they come as a set! The grey shades play off of my grey bed very well, the crystals add a nice glam touch. Safavieh Lighting 15-inch Derry Grey Shade Stacked Crystal Orb Table Lamp (Set of 2) - 9" x 9" x 15"
Delicate cut crystal assumes a chic new persona in the Ashford crystal orb table lamp with contemporary charcoal grey geneva shade. These slim lined lamps are understated and sophisticated with a reverence for traditional crystal artisanship. Dimensions 16 in. H. x 9 in. W. x 9 in D.
These lamps are quite attractive, and go well in my room. However, please note the size. I did not pay enough attention and the lamps are too low on my bed tables to provide good reading light. On top of the height, the gray shades also reduce the amount of light produced. I take the shade off of one to enable reading at night. I saw these exact lamps elsewhere for about 40% more than I paid for them here. I really liked the crystal candlestick part of the lamp w silver vase. All though the crystal is plastic/acrylic, It doesn't look like plastic. It looks more like glass. They were well worth the $$$. They're not some light weight cheap lamp. The base has weight to it so it won't easily knock over when you're fumbling in the dark. The gray shades or heavy duty plastic type on the inside with fabric on the inside. They came with the bulbs too. They added the perfect touch to bedroom nightstands. I will definitely buy this brand for my living room. Love these lamps. I purchased this set for a gift. My family think they are great and loved the idea of the colored grey shades against the glass bases. High quality and I actually ordered a second set of these lamps for our daughter. They made the bedroom a perfect accessory and beautiful. Love - Love the color of grey. Great buy and very expensive looking even though they were so cost efficient. A real deal. 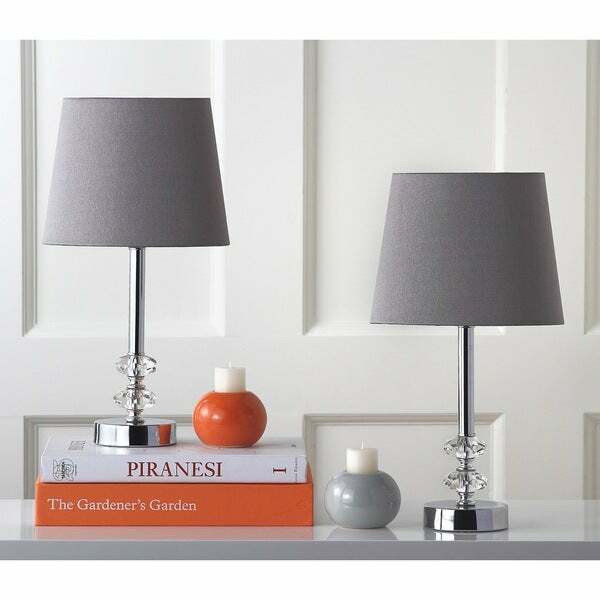 This little grey shade crystal table lamps are absolutely beautiful and they match with my master bedroom decoration the only thing that disappoint me it’s that they are too short. These are the cutest lamps ever. Very good quality. I like that the lamp shade isn't a solid grey. It has a subtle texture with a few lighter greys through out. Over all I love these lamps, very elegant and I love the grey shades, however, with the darker shade makes the brightness of the light is a bit too shaded. Will probably will use a highr wattage then I should. Cute little lamps. Brings great charm to any room. Was expecting these to be taller than 16 inches but my mistake. Made of very durable materials and good quality for the price of two. I bought these to go in my living room because my color scheme is blue and gray and white and it brings just the right Shade if gray when they are on. The crystal orbs match the ones I bought for my bedroom and are just cute. I absolutely love these lamps. The color of the shades were the perfect color and the base of the lamp was gorgeous with the crystals. As much as I want to keep them I have to return them because I failed to look at the dimensions. They were way too short so I’m going return these and see if I can get the same lamp but just a bit taller. If not I’m sure that I will be able to find a replacement. These lamps are pretty but they are actually pretty tiny. They are much too small to be used as nightstand lamps which is what they were originally intended for. If you need smaller lamps they are beautiful; I just probably should have looked at the size description more closely. The lamp is very nice perfect my bedroom, I have all black furniture in my bedroom an the lamps are excellent addition. I love these lamps! Perfect for my bedside tables. The photos do not do them justice! The price was the best deal for the pair. I looked at a lot of stores and could not find a lower price for the quality here. Very elegant! Loving my new lamps. Cute and chic. Doesn’t take up so much room on my night stand. These lamps are perfect for nightstands. The one complaint I have is that one of the bulbs was broken on arrival, but no big deal. Decent lamps. Packaged well, arrived when expected. They look just like I pictured them, very nice! I was happy there was no shipping damages. The lamp shades are a great shade of grey. Just the right size and color for my bedroom. Porch & Den Linkwood 16-inch Ashford White Shade Crystal Orb Table Lamp (Set of 2) - 9" x 9" x 16"